The SOMA bike on the left is custom built by ABR (Approx. $3000). 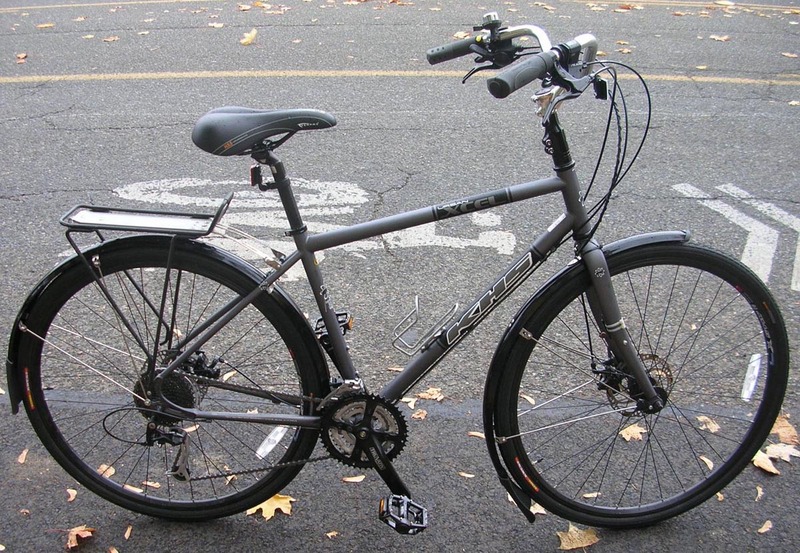 The KHS bike on the right is a typical hybrid modified by ABR (Typically $500-$600). Older rigid mountian bikes are also perfect for conversion (see below). 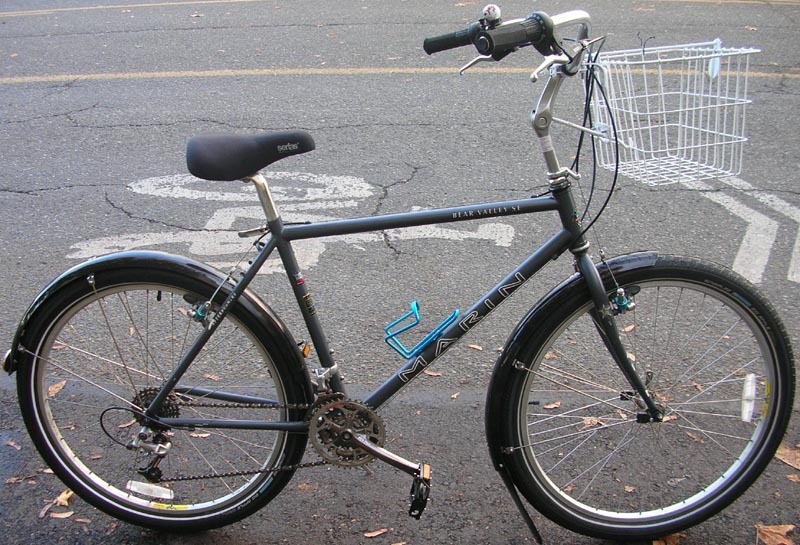 Here at ABR we have a different idea about what makes a good city bike. Once you examine the details, we think you will agree. The bicycle industry (and most other shops) are driven by slick marketing and what ever is trendy, cool or racey. Disc brakes and carbon fiber race bikes for example. The features of a good modern city bike are comfort, utility and durability. 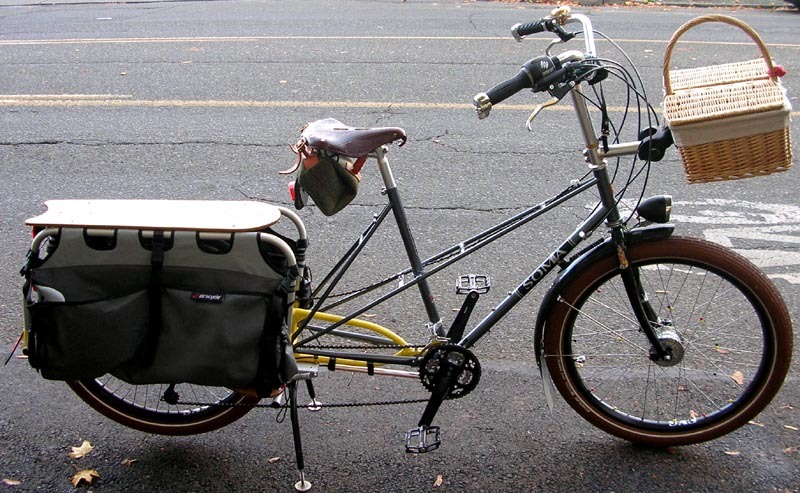 Specifically: Handlebars that give an upright position, Hub Brakes, Kickstand, Fenders, Lighting System, Bell, Flat Pedals, Luggage Rack, Gears for the terrain. Full length steer tube Cut short steerer. Note extension. City bars stock. Flat motorcycle bars normal. Durable drum brakes. 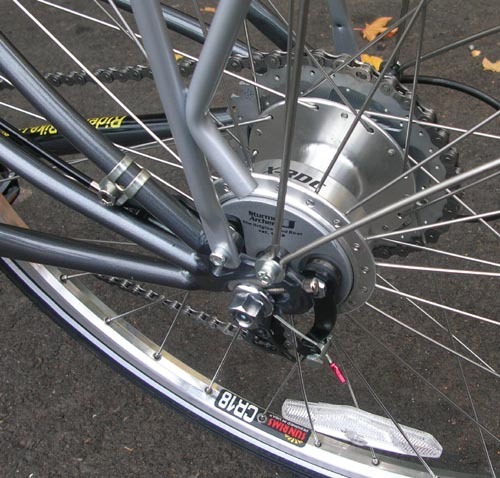 Inexpensive finicky disc brakes. Below you will see more specific examples of what makes our bike better for city use. Your lights can always be on for increased safety and visibility. 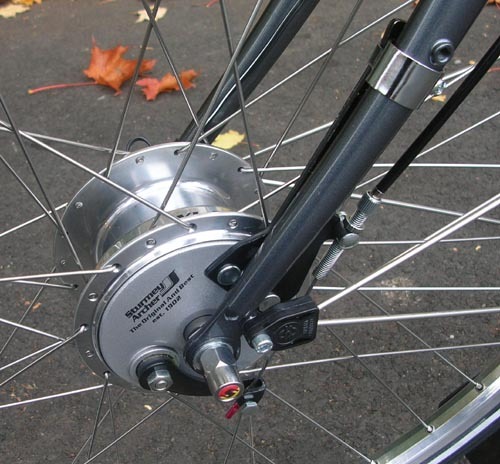 Front hub drum brake with generator. Same braking wet or dry and the generator can also charge your smart phone. Platform pedals with steel traction pins. Wear shoes for the weather. Never have cold feet again! 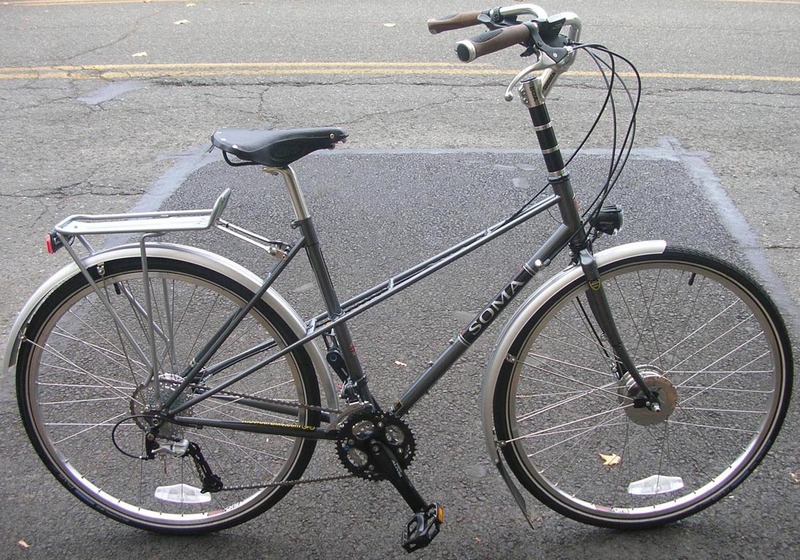 Externally geared drivetrain offers the lowest gears for Seattle's hills. 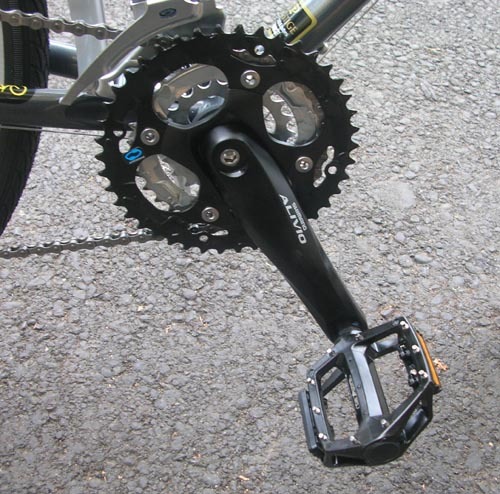 We are strong proponents of internally geared hubs and this frame is compatible. Horizontal drop-outs make that possible. This bike would be very nice with a Rohloff hub. Rear drum brake and cassette hub. Rear LED tail light that stays on when you stop. 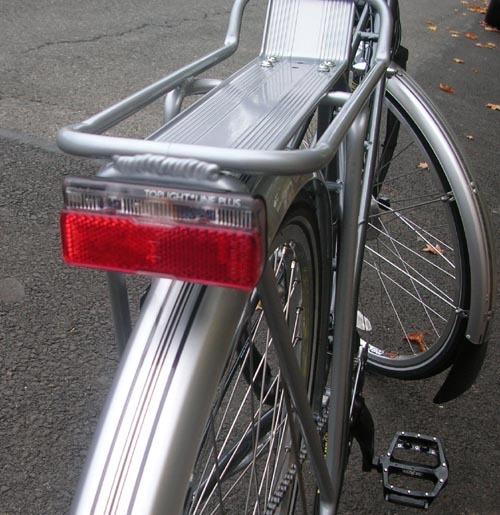 Rear rack and fenders in silver for more visibilty. Black is also available. 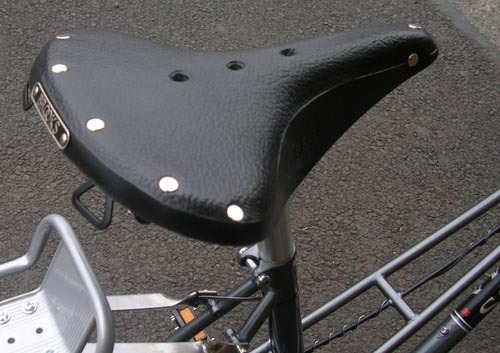 Legendary Brooks saddle for legendary comfort! 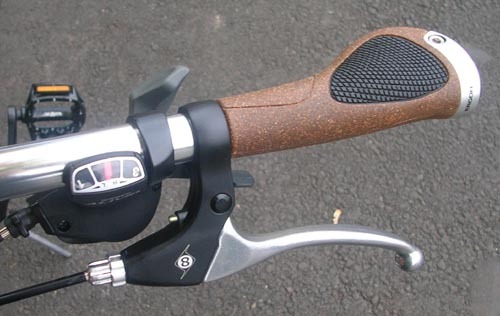 Ergonomic grips, positive trigger shifters and 4-finger brake levers. 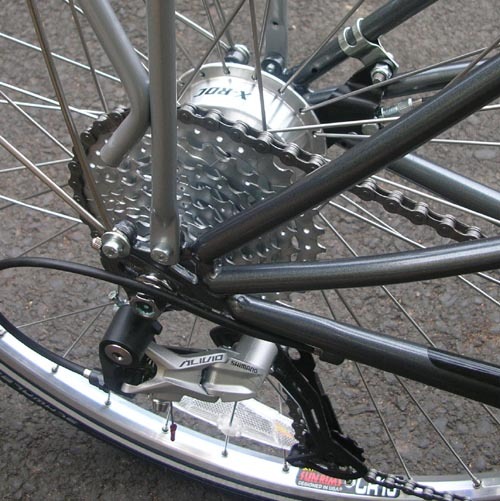 Full length brake levers just feel better and deliver more positive braking. Reach is adjustable. The ball end is more durable if the bike tips over. 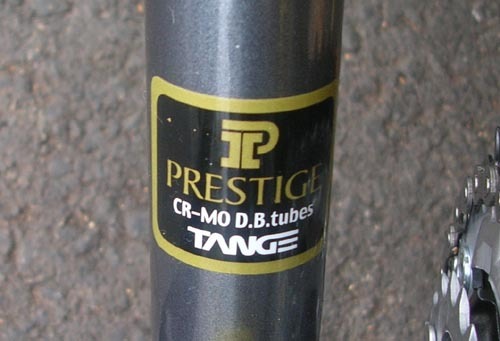 Lightweight steel frame tubes are the strongest, most durable and repairable. 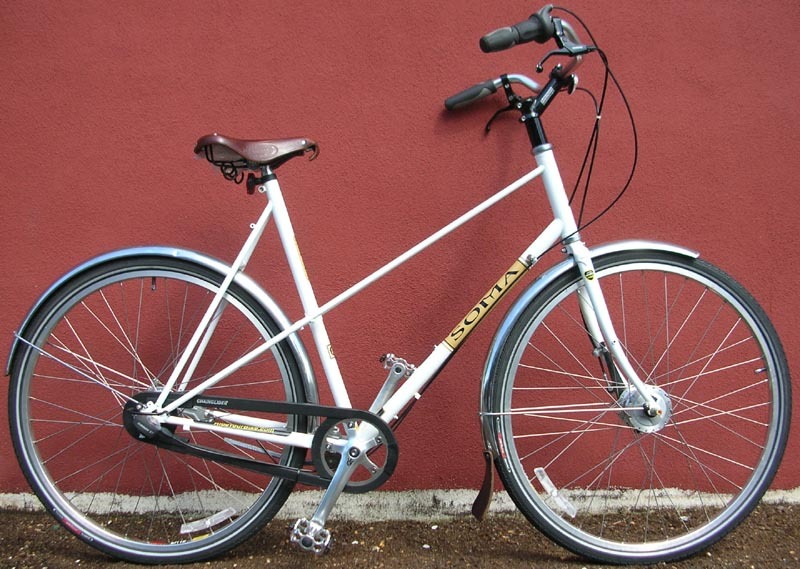 Steel frames are also reasonably priced. Our typical mountain bike to city conversion. We have been doing Upright Conversions for years. You will love riding a bike again! Go find yourself a used bike and bring it in. For between $500 and $600 we can convert into the bike you see below. 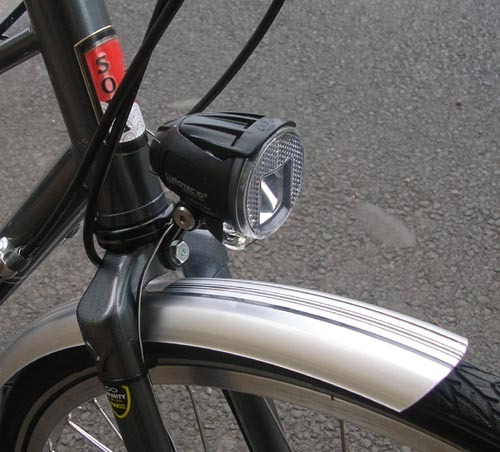 Changes include City Handlebars, Street Tires, Fenders, Flat Pedals and Kickstand. A Basket and Nicer Seat (we recommend Brooks) also make it more comfortable and useful.